Over the past summer, for the final selection in my movie discussion series I created and hosted at a local library, I chose Julie Taymor's woefully underrated Beatles inspired musical art film Across the Universe. Spending over a month digging through Beatles history and music along with reading everything I could on Taymor's movie to complete a multimedia graduate school project that I hosted on my website (which you can see here), in the end, all the research in the world didn't matter when it came to experiencing not just the film but all of those incredible Beatles songs with an audience. The only film I've ever screened where there was a public demand to watch the final credits role to hear Bono's cover of "Lucy in the Sky With Diamonds" with the psychedelic visuals of Evan Rachel Wood and Jim Sturgess, once it ended, the discussion could've gone on forever as we began analyzing not just the film itself but the '60s and what exactly a band like The Beatles meant and still does mean to the world. Leaving a legacy of songs and lyrics that have trickled into pop culture, their music seems to be nearly automatic as we're able to instantly sing along, hum along or tap out the beat of any work when we experience it again, amazed by all of the various phases that the band went through. Yes, there was a devastation for the baby-boomer generation when the band broke up (and some fans began tuning out beforehand), yet-- behind the idea of the writing team of John Lennon and Paul McCartney as Mythic Rock Gods-- they were human beings first and foremost who grew and changed, nearly like a marriage in sometimes spending more time in each other's company than with their own families. 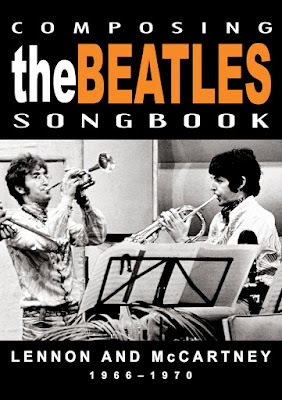 In the second installment of Composing the BEATLES Songbook which chronicles the band's final years of inner turmoil, differing styles and shifting priorities that exclusively focuses on Lennon and McCartney, we're given an analytical almost PhD level dissertation from music critics, biographers, friends and musicians who weave together the history of the band and dissect each piece of music as though it were part of a crime scene investigation. While it does begin to feel slightly exhaustive, clocking in at 112 minutes as sometimes I felt that a few of the commenters could've been edited out when they said something fairly similar to another interviewee, it's nonetheless a must-see for Beatles fans and those who own or cherish any of the latter albums and/or films from Revolver to Abbey Road to get a sense of just what went into the works some of us have come to take for granted. As one interviewee keenly observes, The Beatles mainly consisted of "three different songwriters"--namely Paul McCartney, John Lennon, and then the combination of the two men together. And when the documentary begins, we catch up with the band post Rubber Soul in 1966, when "they were so clearly on top and so clearly the leaders," in an "early approach [that] was very much collaborative" as they strived to push "music forward." As Rolling Stone Magazine's Anthony DeCurtis notes, in the beginning of The Beatles, the music was simple and as Lennon and McCartney just strived to "make [songs] the best" they could and "hope others like them," he notes that admitteldy there wasn't a lot to fight about. However, later on as the two evolved outside the band with McCartney becoming fascinated by theatre, film, literature, and the local art scenes (discovering Avant Garde culture and experimental work) and Lennon was mostly "stuck at home, taking drugs [and] watching TV," their real personalities emerged. A lover of rock 'n roll, Lennon wanted to make music that was rebellious, angst-filled and daring. Having, as one interviewee notes "a big chip on his shoulder," he would later begin distancing himself from the band upon meeting artist Yoko Ono and thus drawing inspiration from everyday items such as a poster ("Being for the Benefit of Mr. Kite"), cereal boxes, LSD trips, and just experimenting with serving up words in no particular order a la Bob Dylan. Meanwhile, McCartney preferred to create classic pop "set pieces" or richly layered "character songs" that some critics likened to great short stories that to me seem to have been a major influence on Bily Joel's story-songs. As the personalities began to clash, especially following the death of their beloved manager Brian Epstein, and the decision to no longer be a touring band (especially after Lennon's out-of-context infamous remark saying they were "bigger than Jesus"), McCartney tried to serve as the driving force behind the band, fighting to keep them together with all his might. Yet Lennon started slipping away, contributing less and less to the records he began publicly calling "McCartney's albums" such as Sgt. Pepper's Lonely Hearts Club Band and Revolver (which was inspired by The Beach Boys' Pet Sounds and Frank Zappa's Freak Out). While they were still able to come together to make some exquisite compositions, in this documentary, we're treated to an insider's view and intense dissection of some of the band's biggest hits and most artistic work such as "Tomorrow Never Knows." Additionally, the critics discuss McCartney's "Penny Lane" and Lennon's "Strawberry Fields Forever" (which was the B-side to "Lane" yet now is perhaps far more favored), "A Day in the Life" which they call the "best of both worlds [and that without both men] the song would be far less satisfying." In one of the band's most alternately popular yet bizarre offerings-- The White Album-- we're given terrifically revealing insight as John tried his hand at gorgeous McCartney styled ballads with "Julia" and Paul switched places, rocking harder than Lennon with "Helter Skelter." And while fans have found it easy to lay blame on various people and circumstances over the year from drugs to Yoko Ono to egos as well as the changing of the times, one realizes that it's a combination of everything as-- despite our wish to freeze frame them into some singular point in time and say "this is what you should do and this is who you are"-- artistically and personally they grew and changed and moving on. Yet in doing so, thankfully they've left us with-- as we discussed in my film group this summer-- an amazing array of compositions that ultimately helped create the soundtrack of the twentieth century. I'll leave the speculation and finger pointing to others. For in honor of Thanksgiving and simply my love for the joy and inspiration their music brings, I'd rather just celebrate their musical legacy, since in the end, when it comes to The Beatles, "all you need is love."